The February 2019 issue of Cherry Lodge News has now been sent to everyone on the Cherry Lodge Cancer Care mailing list. It is also possible, via this website, to download a pdf of the newsletter to read onscreen or to print out. 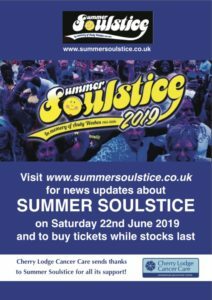 Note that if you no longer wish to receive a copy of the newsletter by post, you can unsubscribe by contacting Tina by phone on 020 8441 7000 or by email. 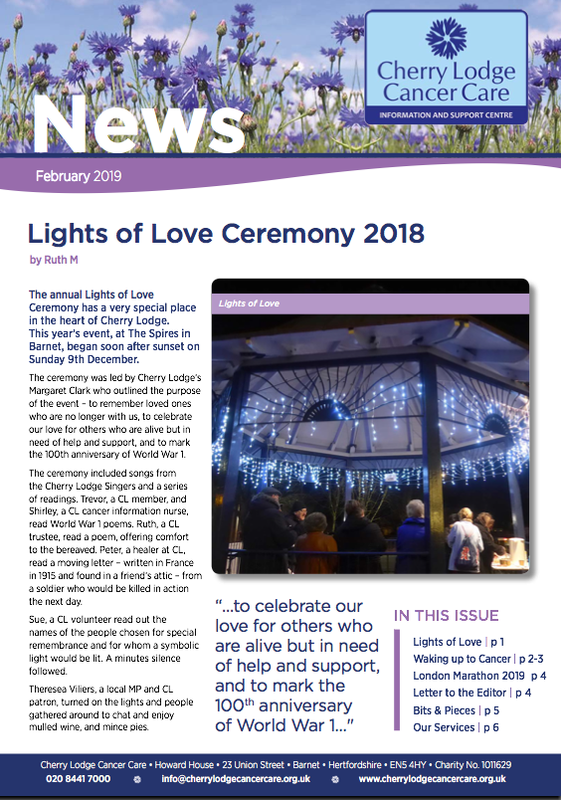 Our new issue begins with a description of Cherry Lodge’s annual Lights of Love Ceremony, held on Sunday 9th December 2018. This is followed by an inspirational account of the experiences of CL member Amanda Wiles, under the very apt title ‘Waking up to Cancer … the power of the human spirit’. 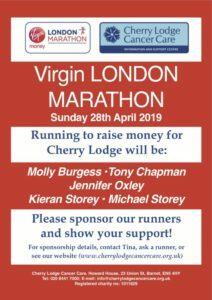 We also publish the names of the five runners signed up to run for Cherry Lodge in the London Marathon in April – please sponsor them if you can. Regular features include: ‘Letter to the Editor’ (with information about CL’s Seated Yoga group)’; our ‘Bits and Pieces’ noticeboard; and a summary of CL ‘Services and Approach’. You can access the complete February 2019 newsletter by clicking here. To access our three most recent newsletters, our latest Annual Report and a current Cherry Lodge leaflet, go to the About Us page of the website and then click on the appropriate item in the right-hand column under Downloads.